Mom woke up with the sickies today. That means, I had to take charge! Quiet down here! Mom is sleeping! I sent Dad to work and asked Grandma and Grandad to come and take Puppy for the day. Whem Mom is sick, I can only snoopervise her getting better, because she's Mom, know what I mean? Anyway, we just woke up from morning nap and she seems a little better. She said she's headache and I told her to eat something. We'll see what happens after that. OK, I'd better go make sure she eats. Mom says it's cold enough to freeze your ears off! Much as I'd LOVE to go exploring, I think maybe I stay here where it's toasty. Of course, you know what that means right? Someone had better start scratching my ears. Phew, I almost didn't make it into Mango Minster this year. Mom has been slacking off. So much so that the only category I can enter this year is Bad Sport. I blame Mom. It's Mom's fault! If she had been more on the ball, I could have been in the Good Old Boy or Diva category where I belong. Now she's going to drag up all the "BAD" stuff I've done. Fine Mom, bring up the gazillion sets of sheets and pillows I ripped up when I was just a puppy because I had really bad separation anxiety. Bring up that I don't like any other dogs near MY Puppy so I bark and growl and try to lunge on occasion so that I almost rip your arm out of your socket. 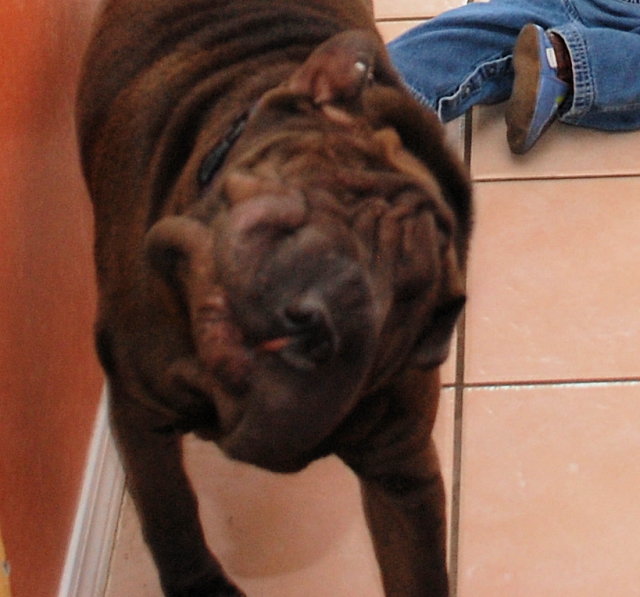 Honestly, does this look like a Pei who would lunge? I'm practically melting into the carpet! Oh, nice call Mom. 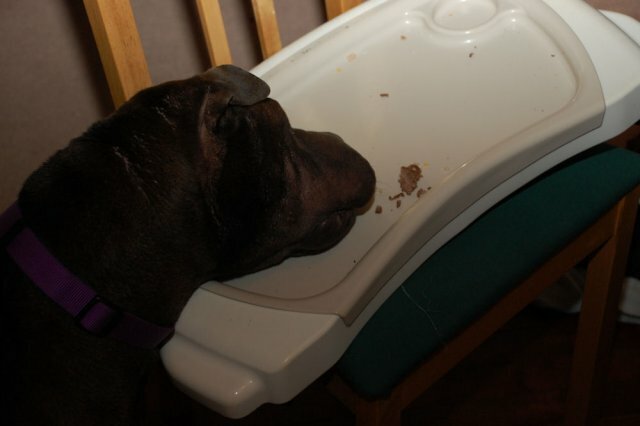 Post the staged photo of me eating hamburger from Puppy's tray. That's not bad, that's expected of me. Mom even called me downstairs saying it was clean up time. Oh, yeah. Figures she'd bring that one up. Hmmm, well, I still blame Mom for that. It's not my fault that they LEAVE ME BEHIND. 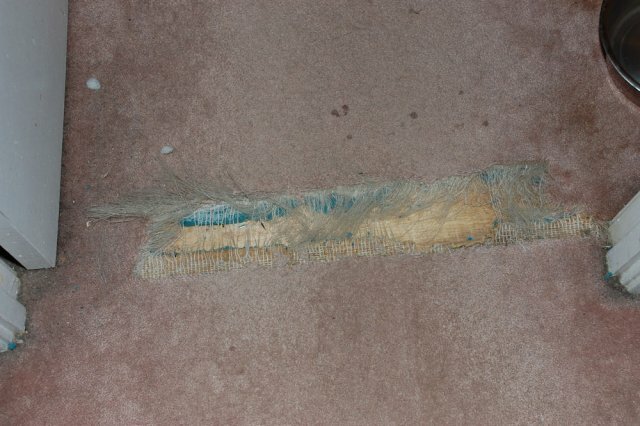 Any other dog would try and dig himself out of a second floor bedroom wouldn't he? I'm not a Bad Dog, honestly I'm not! Well, other than being cold enough to freeze your ears off, today has been an pretty uneventful day. I did have a bit of fun this past weekend though. Friday I went to see my girlfriends and guyfriends at the PetsHotel. I got some serious cuddling from them. I think they missed me. Saturday I was in charge of Dad and Puppy. Mom said so as she left that morning. I think I did a pretty good job. Everyone was AOK when she came home so I must have been an awesome Saturday Snoopervisor. Sunday I had a NOSEVENTURE. As per usual, Mom didn't have her camera. She says it's because it was a spontaneous Noseventure. Well, ok. I guess. Spontaneous Noseventures are kind of awesome. Anyway, we ended up at Great Granny's house! 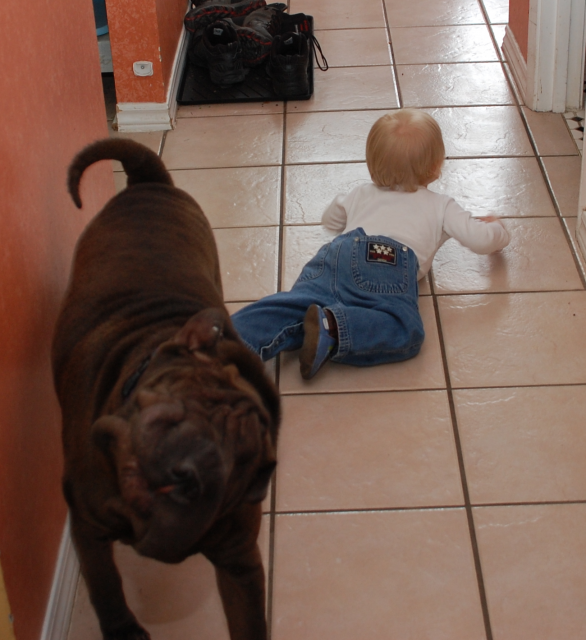 We all had lots of fun there and Puppy and I got to play with our cousins - nicknamed Chaos, Panic and Disorder. Mayhem wasn't there, which is ok, I had enough people to Snoopervise! OK, time to go and warm up. I'm still cold from the last time I went out to do my thing! We've had snow for the last few days. Not a huge amount of snow, it's barely passed my wrists, but enough so that my backyard is covered. Here I am investigating it. Things change when they're snow covered - FYI. Mom has promised more pictures today, I'll make sure she gets some of me so I can post them this week. Now if you'll excuse me, I must go and snoopervise Puppy's nap - he's getting much better at them - and Dad is fiddling with stuff which just SCREAMS "INVESTIGATE ME!" No time for a picture, I HAD to get this out as soon as I saw it. Hero is on the mend! Please still send him some Power of the Paw, but know that it is doing some good. His people report that he has no new infections, he has started eating and he's healing. Mom cried when she read that to me. Then she gave me a big hug (as per Hero's request) and I got wet. I hope Hero appreciates that I got wet. Hugs are worth it though, even if your head does go soggy. because of the tears. Other than that, not much new. I'll bug Mom to get more pictures taken of me. 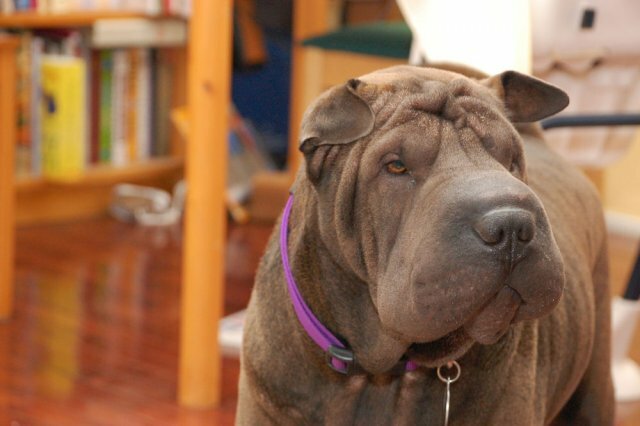 She's doing a 365 photography project so I hope to be back to my Pei-fessional modeling soon. What do you think? Nice profile eh? 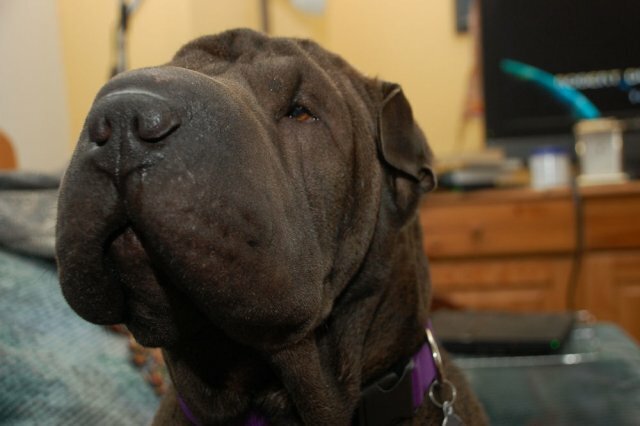 Mom says I look a little Roman in the nose. Ok, sure, whatever. So, I was doing a lot of thinking today while Mom was out having fun without me. What's going on with my friends that they've started to get sick? 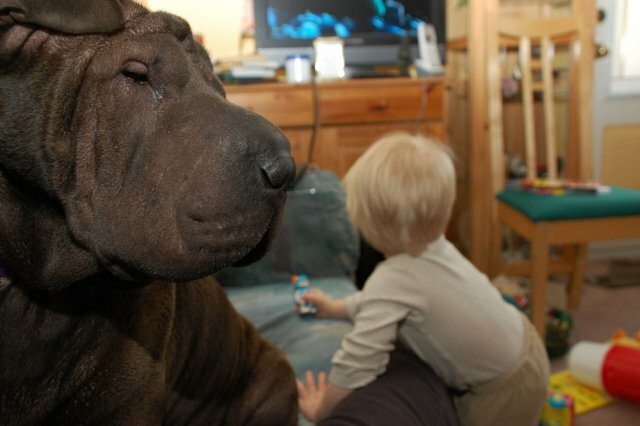 No news from Hero Shar Pei. Paws crossed for him. No news is good news right? 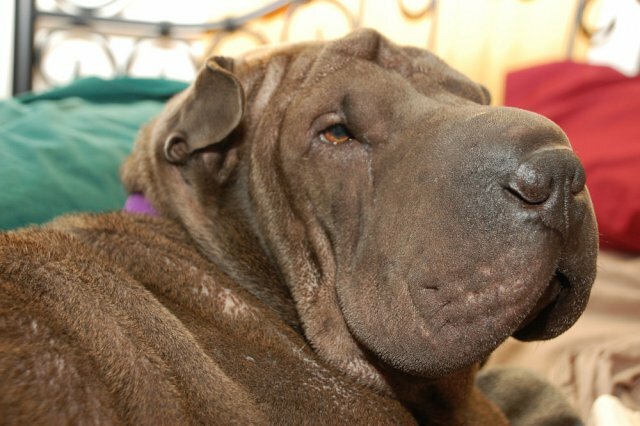 Miss Lola Shar Pei (no direct relation) seems to be having a case of sickies, her brother Franklin says she's on the mend. Pippa is getting over a tick borne disease. I was a little concerned that it was because of close association with me, but Mom says that's not possible. Well, as long as you're sure Mom. That's about it for me. Mom says she's ready to go to sleep so I'd better go steal her blankets before she gets there. Sorry about not writing yesterday, we fell asleep before we could write. It was full blown Bolo Cuddle Sandwich last night. I'm sorry to say, that's a little bit more important to me than blogging. It would be nice to do both, but if I have a choice, I'll take the Bolo Cuddle Sandwich every time. Cuddles from my Auntie Sharon! At this point, if I were a girl, I'd go SQUEE. 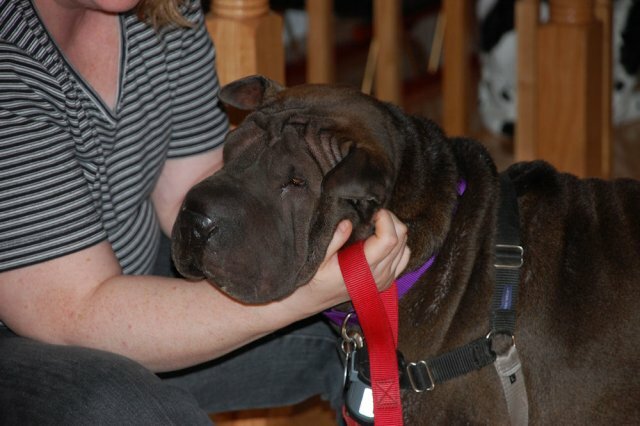 Uncle Marty gave me cuddles too, but Auntie Sharon's cuddles are PAWESOME. Sigh. Here I am enjoying more of them. I know my face doesn't look like it's excited, but I was in a cuddle coma there. Sigh. Thank you Auntie Sharon and Uncle Marty for the cuddles! And thank you Grandma and Grandad for hosting them so I could get my cuddles! They've gone back home now. Sigh. I miss them already. In other news, 2011 is turning out to be a rough year for my friends somehow. 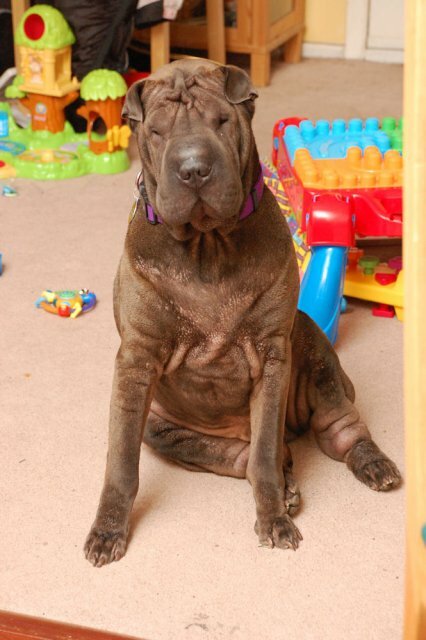 Pippa is fighting a tick disease and still no word from Hero Shar Pei. Although, honestly, I'd rather Hero and his people concentrate on getting him better. Better is more important than blogging. If anyone has any extra Power of the Paw, please send it their way. 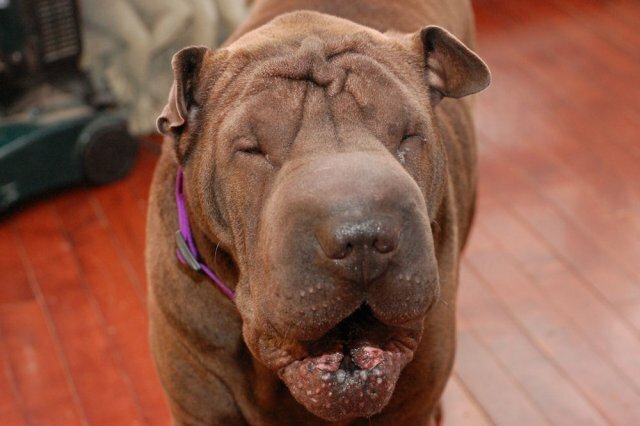 Mom caught a GREAT picture of me last year (snort) last week actually. That's Puppy in the background, in case you were wondering. Look at that face! Mid shake! There's a close up. I'm barely recognizable! So I had a FANTASTIC Noseventure today! Actually, I had two, but Mom hasn't edited the pictures from Part Two, so I'll tell you about Part One. First off, Mom said the magic word, FJORD! WOHOO! Then Dad got Puppy into his chariot, and me into my harness and we headed outside. Mom took us down the street to return something that she bought that didn't work. We got there and WOW! Dad had parked the car at the store! He wasn't there though. I was confused. Mom said it was all ok, let me into the car out of the wind and went off to the front door of the store. She was back about two minutes later, the store wasn't open yet. Dad showed up about then and I headed off with Mom and Puppy, back down the street we had come to the PetSmart! 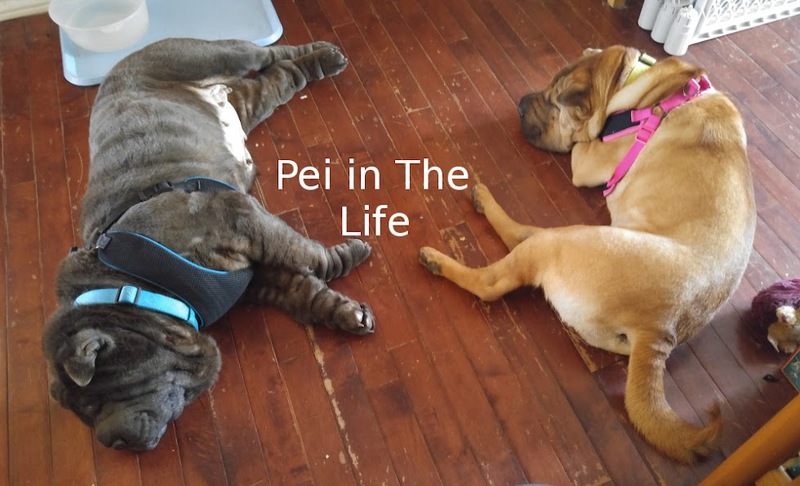 Dad came out of the store and said there was a baby pei there! Mom went Squee. 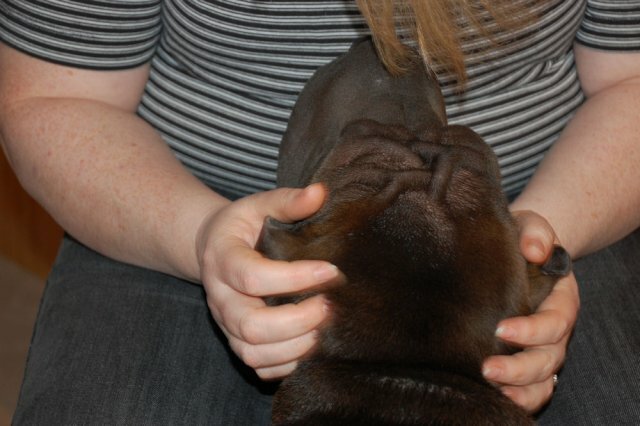 He was cute and black and about 9 months old and Mom was allowed to hold him and hug him. I was only allowed to snuffle him when she held him. He was very cute, I have to admit that. His parents were impressed with me too. Dad and I then went back to the store that hadn't been open while Mom walked with Puppy and I don't know what happened because they left me in the CAR! I hate the fact that dogs can't go everywhere unless they're service dogs. That's speciesism IMO. Anyway, it finally ended up that Mom drove me home with my dog food - how did I miss Dad getting dog food I don't know - while Dad and Puppy walked home. Phew! I'll blog about my afternoon Noseventure tomorrow! 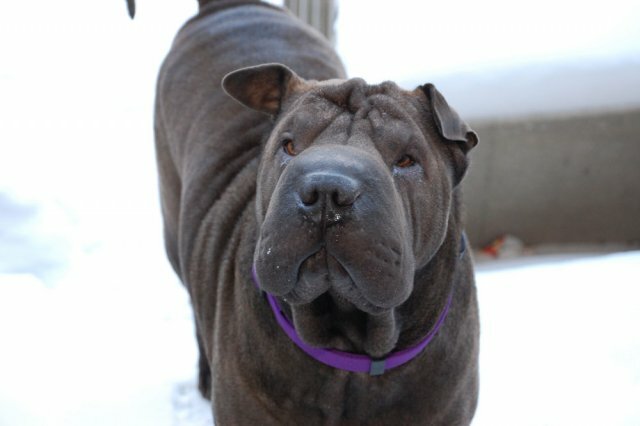 Pei-Ess, has anyone heard how my buddy Hero is doing? I'm getting worried. Still sending Power of the Paw Hero. 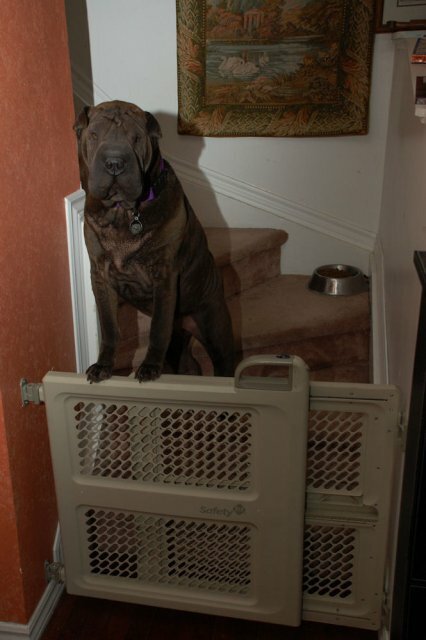 That's me waiting for Mom to open the gate (Puppy is crawling everywhere and Mom and Dad put the gate up so I could go upstairs and get quiet time if I needed it.) 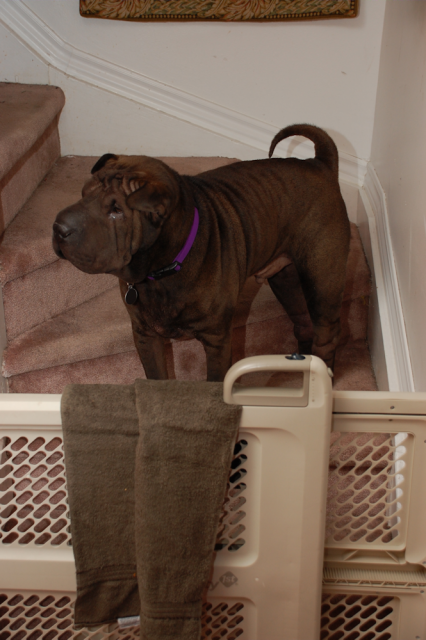 Anyway, I'm also pointing toward the door, waiting for Mom to open the door and let the New Year in! First of all I wish everyone health and happiness and lots of snuggles and cuddles and whatever makes you happy. So Mom and Puppy and I have been watching an old show from the 1980's - which is forever ago in dog years - called The Adventures of Sherlock Holmes. It's been fun, Mom gets a trip down memory lane, I get cuddles - I really don't see anything wrong with this arrangement do you? So a few days ago, Mom started an episode called The Hound of the Baskervilles. Already it sounds awesome doesn't it? Anyway, imagine my surprise when we started watching it, that my buddy Tommy from the Poupounette shows up in it! Here, Mom found a linky at You Tube. Tommy makes his first appearance at 5m 15s but you get a great look at him at 6m25s. Mom says it can't be Tommy, because he's much too young. Unless he's a time traveler! What? It's possible! Mom says I need to stop reading the sci-fi books she has on her ereader. OK, fine, I'm going back to bed to help Dad play with his new iPod.